Magic the Gathering MTG Shards of Alara booster box contains 36 booster packs with 15 cards each. 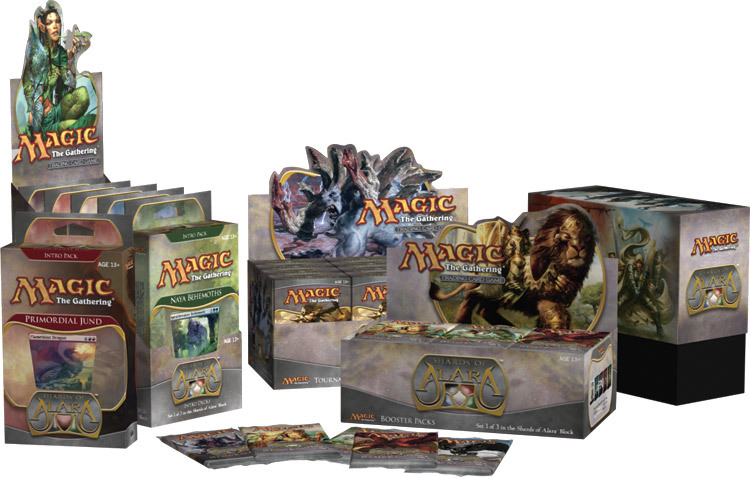 It is the 47th limited-edition expansion set for Magic and was released on October 3, 2008. On Magic Online Shards was released on October 20, 2008. Shards of Alara is the first set in the Shards of Alara block. The set contains 249 black-bordered cards (15 mythic rare, 53 rare, 60 uncommon, 101 common, and 20 lands). The mythic cards have a red symbol and are introduced for the first time in Shards of Alara. Shards of Alara is the first set of the Alara block. Bill Rose was its lead designer, and Devin Low was its lead developer. Shards is a multicolor set which revolves around three-color combinations. Its tagline is, "Five worlds share one fate." The design of Shards of Alara focuses on five different "shards" which together formed a single world once. Mechanically, each shard consists of one of the five magic colors and its two allied colors. Each shard has its own key worded mechanic or strong over-arching theme, and its own creature types. The five shards were designed separately by three person design teams. Shards of Alara introduced several changes in Wizards' design and publishing approach. Sets from Shards forward have a smaller number of cards, to reduce the size of the card pool for Block and Standard constructed tournament formats. A new level of rarity, "Mythic Rare", was added; mythic rares replace a booster pack's rare card in 1 out of 8 packs. Also, as part of a move to make products more beginner friendly, booster packs include a basic land in place of one of the commons, and pre-constructed decks will be rebranded as "Intro Packs" including a 41-card preconstructed deck and one booster pack. There are design changes to the fat pack, which for Shards includes five distinct box arts and the replacement of the usual set novel with an excerpt from A Planeswalker's Guide to Alara. Shards was the last set for which tournament packs were released. Shards of Alara also brings new planeswalker cards to the game. The first multicolored planeswalker to be revealed publicly was the red and green Sarkhan Vol. It was followed shortly by the white and red Ajani Vengeant, which is a new form of Ajani Goldmane from the Lorwyn set, and was the promotional card at Shards prerelease events and Launch Parties in September/October 2008.